Cowboys Beat Packers with 30-16 Win! Rookie Dak Prescott is stating an impressive case to remain the starting quarterback of the Dallas Cowboys. He’s off to quite the start in his NFL career after taking over following veteran Tony Romo’s preseason back injury. Prescott threw for 247 yards and three touchdowns, and the Cowboys forced four turnovers in a 30-16 win over the Green Bay Packers and their dysfunctional offence Sunday. Prescott was 18 of 27 and shook off two fumbles and an interception to lead the Cowboys (5-1) to their fifth straight win. “You just couldn’t ask for more inspiration from a player because everybody on this team knows what a difficult position that is to play,” Cowboys owner Jerry Jones said. Prescott showed poise in the fourth quarter while marching the Cowboys on a seven-play, 75-yard drive that ended with a 4-yard touchdown pass to Cole Beasley for an 18-point lead with 10:26 left. Romo seems to be getting closer to returning. After a bye, Dallas next plays on Oct. 30 against Philadelphia. Prescott picked on a Packers secondary that played much of the game without their top three cornerbacks because of injuries. His fourth-quarter touchdown pass left Packers fans at Lambeau stunned. They were booing at times following another choppy game for Green Bay’s offence. The four turnovers were a season high for Green Bay (3-2). The Packers had five fumbles on the day, losing three. Even two- NFL MVP quarterback Aaron Rodgers wasn’t immune from the jeering. Rodgers finished 31 of 42 for a season-high 294 yards. The Packers didn’t get into the end zone until Rodgers and Cobb connected on a 6-yard touchdown pass with 6:53 left to get within 27-16. Rodgers accounted for two turnovers with an interception to go with a fumble on first-and-goal at the Cowboys 1 with 1:10 left in the third quarter. It was a designed draw play out of an empty backfield. 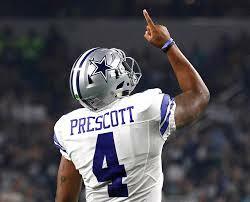 Prescott threw the first interception of his career after he was picked off on third-and-8 from the Dallas 6, throwing out of his end zone with 20 seconds left in third quarter. Safety Morgan Burnett had the diving interception. Prescott’s NFL record streak for a quarterback at the start of his career without an interception ended at 176 pass attempts. He broke the mark of 162 previously held by New England’s Tom Brady earlier in the game. Drops were a problem again at times for Packers receivers. Timing may have been off on a couple other throws. Rodgers and McCarthy said the Packers would figure out the problems after watching the film. “We’re hard on ourselves, and I’m as hard as anybody on myself. So I’m going to get it fixed. Just been a little bit off,” Rodgers said. It was Green Bay’s worst defeat at home with Rodgers as the starting quarterback since a 37-20 loss to the Giants in the 2011 NFC divisional playoffs. Dallas dented Green Bay’s league-best run defence. The Cowboys rushed for 93 yards in the first half against the Packers, which was already a season high against Green Bay. The Packers had been allowing 42.8 yards per game entering Sunday. Dallas was averaging a league-best 155.2 yards per game. Rookie Ezekiel Elliott finished with 157 yards on 28 carries, giving him 703 yards rushing — the second-most in a player’s first six career games, behind only Eric Dickerson (787). Elliott also became the only rookie to rush for at least 130 yards in four consecutive games. Cowboys: CB Morris Claiborne left with a concussion after getting hurt in the second quarter. Packers: The Packers’ thin secondary, which was already without CBs Sam Shields (concussion) and Quinten Rollins (groin), lost cornerback Damarious Randall in the second quarter after he re-aggravated a groin injury. … WR Davante Adams left in the third quarter to be evaluated for a concussion. … RT Bryan Bulaga left late with a back injury. Cowboys: Host the Philadelphia Eagles on Oct. 30 after a bye next week. Packers: Host the Chicago Bears on Thursday night.